Raumplan , masterplan, plan libre , planned community, game plan, health plan, escape plan, business plan, floor plan ... There is likely no other word in the architect's, landscape architect's, urban designer's, urban planner's vocabulary that is more vacuous than "plan." When uttered, its use and application are completely overlooked, or resigned to technicality. Can the agency of the plan be entirely rethought to no longer be simply relegated to a set of descriptive orthographic drawings? Can the plan be resuscitated into new life, new applications, new considerations? Often overlooked and recently playing supporting actor in the age of the section, the plan is ripe for rethinking. More recently, plan drawing has been absorbed into representation systems of mapping, diagramming, and indexing, therefore relegating plan drawings simply to plan-making. Frequently assigned the role of orientation device, the plan is subjected to quantitative scrutiny while the section is permitted qualitative indulgence. The conventional system of architectural plan-making predominately presents itself as evidence of area, structure, and territory. But as with all orthographic drawings, plans can never be experienced as such. Demanding near omnipresence, a plan drawing cannot be easily occupied as it privileges a view our vision cannot replicate. Plans are vehicles for transpositional experiences. To overcome the inaccuracy of plans, architects are often asked to "walk us through the plans." Therefore, though underequipped for the task, plans are employed to act as spatial machines. I would argue for a renewed independence of the plan from the grips of both aestheticized mapping and mathematic drafting. This new "plan" can be seen as a set of pre-considered actions unfolding responsively to new information in amanner similar to a plan but dynamic (like a section) and temporal (like a diagram). This sets a distinction between plan-making and making plans. Architecture typically relies more upon plan-making, an almost documentary exercise. In contrast to this, making plans permits architecture a more atmospheric unknown quantity as the plan invites only a cloudy forecast of its potential. A common inquiry when confronting a problem or issue is "What’s the plan?" Making a plan embraces the full meaning of this question. Making a plan is a machine prescribing a set of actions and relationships, whose result is not only not yet known, but possibly not even relevant. As in fuzzy logic, making a plan is a rigorous description of uncertainty. It is an exercise in anticipating the atmospheres of architecture. Making plans are forecasts of techniques and strategies, a roadmap of actions yet to be executed – as in a business plan, a marketing plan, or a lesson plan. Here, the plan is suggestive of the phasing or implementation of work more than it is its anticipated outcome. It is a recipe, an outline, or a template for the organization of matter. Though, like with business plans, sometimes the plan is ill-conceived. And the plan frequently lies, or tells (innocent) incomplete truths, of the anticipated result. The plan is often evasive. 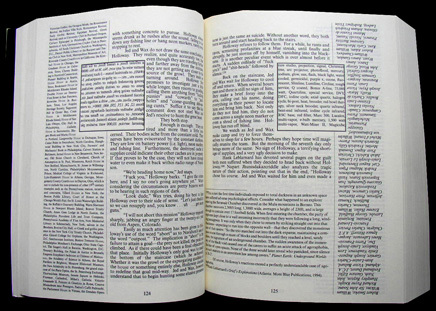 Page spread from Danielewski's House of Leaves (2000). In Mark Danielewski 's 2000 novel House of Leaves , one of the three embedded stories follows a family that has recently moved into a new house. Upon moving in, the new occupants discover a previously unaccounted for space. Attempting to understand how this space has just appeared, they measure the outside length of the house as compared to the inside length. This yields a 5/16" discrepancy. Numerous recalculations only affirm this difference. The inside measures longer than the outside. This leads to a series of filmed expeditions into this space. In Danielewski’s extreme poche , the plan deviates from expectation, revealing a rogue space that eludes even the quantitative logic of the plan. Its presence is only proven by dimensional mathematics. The plan is often littered with discrepancies, fortunately. 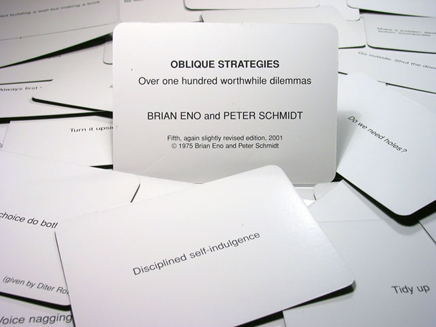 Eno and Schmidt's Oblique Strategies cards (1975). Brian Eno and Peter Schmidt collaborated on a set of cards called Oblique Strategies that was released in 1975. They realized that they each kept by their side a set of suggestions or critiques that spurned them on in moments of hesitation or pressure. These were intended to instigate unforeseen outcomes prior to settling on an existing strategy or plan. Like little voices, the cards suggest: "simple subtraction," or "emphasize differences," or "Look closely at the most embarrassing details & amplify them." Oblique Strategies demands a willingness to have a plan pushed in another direction; To have a plan voluntarily hijacked. The plan can and should be reconsidered. Results of Martin Wattenberg's Shape of Song program (2001). Martin Wattenberg has devised a technique and program for illustrating the shape of a song . The software works like pattern recognition. It seeks out similar sound sequences and brackets them with a translucent arch. Similarities and sub-similarities at a range of durations stack up eradicating the need for notes and staff. Wattenberg's venture highlights that planning is often the management or curation of repeatable elements. How often to repeat and where within a work? The plan yields unexpected symmetries. A playbook fragment from the Arizona Cardinals. Every good team keeps a playbook that documents rehearsed plans of action, or plays, for use in the heat of a game. (Even the hail mary , the ultimate desperation play, has its own setup.) The success of the game plan is the frequency and order in which they are used. But it is also dependent upon knowing which plays should not be used with which opponents. The plan can be changed … at the last minute. Twelve Leverage Points were devised by scientist Donella Meadows to address the possibility for change within a large system. In this case Meadows was referring to the environment as such a system. She documents twelve properties in which to intervene that allow a small transformation to ripple fully across a larger system. The plan should be entirely reconfigured when tweaked. 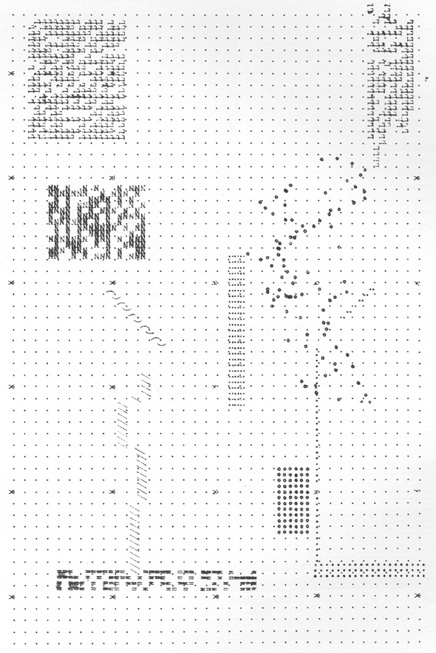 The patterned plan(s) of Archizoom's No-Stop City was generated using a typewriter (1969). The plans for Archizoom 's 1969 No-Stop City were typed out on a typewriter. The plan emerged from limitations of typesetting: leading, tabs, indentation, and spacing. Appropriately enough, the project conceived as architectureless architecture is represented with a planless plan. Operating more like graph paper, the plan was seductively incomplete and awaiting occupation. The plan is often vacuous intentionally. 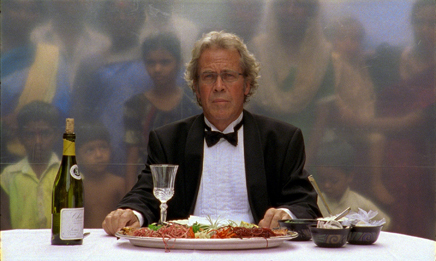 A scene in the "most miserable place on earth" (according to Leth) from The Five Obstructions (2003). In Lars von Trier 's 2003 documentary film The Five Obstructions , he invites his mentor Jorgen Leth to remake the 1967 film The Perfect Human with certain limitations, or "obstructions." Von Trier attempts to crack what he perceives as Leth's tendency toward comfort. The first re-make forces Leth to shoot in Cuba with no set using shots no longer than 12 frames. What initially seems to be limiting and constraining becomes what von Trier later calls "a gift." The plan should have rules that necessitate ingenuity. Plus-Minus by Karlheinz Stockhausen (1963). 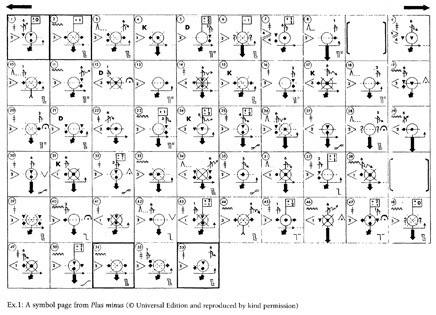 Karlheinz Stockhausen ’s 1963 piece Plus-Minus contained the notes reading "Instrumentation unspecified; Duration unlimited," yet it contained six pages of instructions, seven pages of musical notations, and seven pages of symbolic notations. 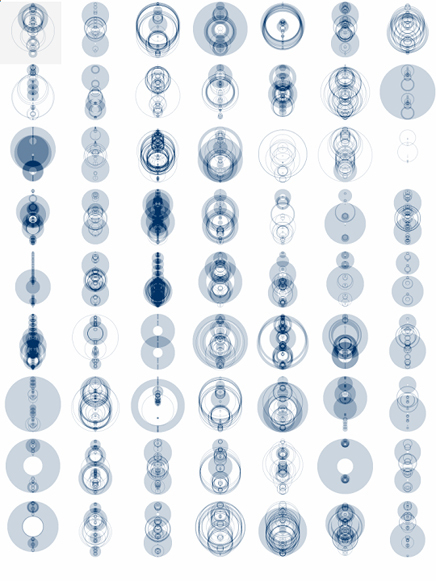 Each symbolic notation page contains 53 frames read left to right and up to down. Within each frame is a form-scheme outlining duration, form, and effect. The piece does not declare the number of participants nor the instruments, nor even the range of notes permitted. Instead the plan is pure pattern, a intricate colour-by-numbers. The plan is a formula offering a variety of uses and abuses. 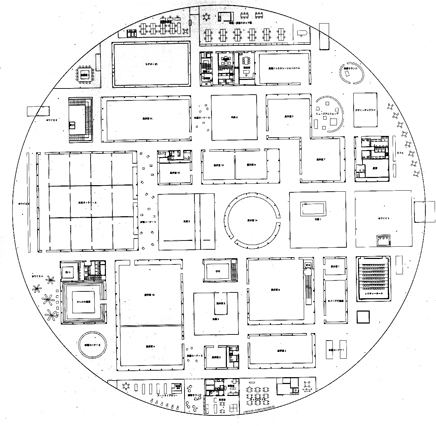 Plan of 21st Century Museum of Art, Kanazawa by SANAA (2004). Kazuyo Sejima and Ryue Nishizawa’s (SANNA) Kanazawa Museum of Contemporary Art and Toledo Museum of Art demonstrate the plan as a hyper-legible system of relational spaces, yet both projects maintain ambiguities about the role of circulation. Movement is absorbed into the buildings entirety, as in Kanazawa, or within the shared edges of spaces, as in Toledo. The plan is the arrangement of programs with degrees of liquidity. "The best-laid plans of mice and men/often go awry"
Wonder what would happen (if anything) when the above "nine plans" are flipped up 90 degrees. For example, a flipped-up 21st Century Museum of Art looks almost like this. ...or just practice the twist in front of the mirror. 2008.05.19: "I'm secretly working on Plan Atypical"
and it's about time we saw some football diagrams on archinect. i've been waiting for that. john cage's method of composition using the i ching. cage would exercise his intention during the pre-composition phase, inventing the rules for how the i ching would be used, but then surrender actual composition to the playing out of those rules. so the plan is a separate entity from the documented composition. steven - true, though i like doing my sum-ups first, and then ramble. i think 'demolition(al)' could be added at number 10.
in a liberating sense of course, to allow occupants to come up with his/her own walls and openings... like apartments in russia. Ease versus difficulty is hardly a sufficient gauge here. I learn from the history of all the plans that are ignored, along with the schematics behind the ignorance. Architecture Not Now indeed! mason, i am glad that you are fond of the idea. i will have to do some research to come with a hidden contemporary plan. thank you for the interesting feature by the way. it happened that i picked up a book with a classic essay by robin evans 'figures, doors and passages' before i came across your article on plans. putting aside all the discussion on plans, what became more relevant after reading a few comments above seems to be the question, 'is architecture important?' we have become sensitive to architecture and landscape and have internalized all the enlightening teachings. but even in raphael's painting of 'the school of athens', architecture seems to leave decisive marks only on more peripheral and self-concentrated figures. however, we believe in the effects of built environments. i think everybody does. the issues are of priority and affordability. people adapt anyway. even architects have to adapt, i.e to economy. economy says, 'we just need free plans with no walls so we can put walls and doors in our interior according to our desire.' then architects have to design apartments like office buildings? i say hell no. i put demolitional walls and doors where i think they should be, but i may put the walls more easily demolitional in case you want to spend more money for an interior architect. Without making plan we can not take currect decision. So for best decision we forecast what type of job we are going to do and how much we have to spent, what type of manpowe will we require. all these type of thing involve in making plan. ok mason, i think i found something. It is possible to read duality in our highly surveiled era from what is demolition(al) in relation to what passes freely. what is relational is demolished when it turns its back on relationship i.e. by setting up a wall either opaque or transparent. But the wall can be remediated through its demolition(al) openings. Mongrel group have been exploring this potential by 'opening up the implicit meaning of media itself - to mediate not by controlling and ordering what can be said, shown or heard, but by providing the means to unblock channels of access, release currents of energy and reveal the margins of what people can feel, sense, reason and imagine'. The plan is the continuous search for a connection. somewhat related to this feature is a show by michael asher that was installed last spring in santa monica museum of art and i just reviewed today in elseplace. i also listed reviews of the show below the entry and there is even a review called "A perfect lack of a plan" by suzanne muchnic of la times. i was somewhat an unofficial student of asher.